At 7pm on Thursday, 8 September, contemporary art festival Survival Kit will be launched at C.C. von Stritzky’s villa, Aristida Briāna Street 9, Riga. This year, according to the thematic call Acupuncture of Society, the festival will address esoteric, spiritualism, mysticism and other non-traditional practices. The festival will be opened with a concert by Iranian musician Hamidreza Rahbaralam, artist Ieva Kraule’s performance Samuel Hahnemann’s Confectionery and Icelandic artist Styrmir Örn Guðmundsson’s performance What Am I Doing With My Life?. This year the festival will run three weeks – from 8 to 25 September. The audiences are invited to a contemporary art exhibition at C.C. 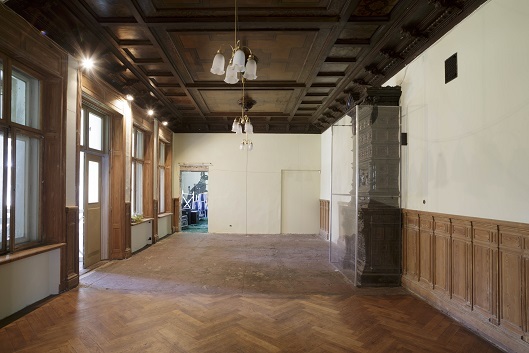 von Stritzky’s villa and a project by artist Floris Schönfeld at the Pauls Stradins Museum for History of Medicine, as well as to attend other events as part of the programme such as discussions, art performances and creative workshops. During the first week of the festival, several events will take place at the Pauls Stradins Museum for History of Medicine. On 10 September the project A Brief History of the Damagomi Group by Floris Schönfeld will be opened. The Museum for History of Medicine will also be the venue for performances La Piscine by Valentina Desideri, Myriam Lefkowitz and Géraldine Longueville, which are intended for one spectator. On 9 September, all three artists will participate in a discussion on experiental art practices. The discussion will be hosted at C.C. von Stritzky’s villa by Lithuanian curator Dovilė Tumpytė. The rich programme of the White Night will please the audiences on Saturday, 10 September at C.C. von Stritzky’s villa. The visitors will have an opportunity to listen to Hamidreza Rahbaralam’s concert, as well as enjoy the performances by Ieva Kraule, Styrmir Örn Guðmundsson and Kaspars Groševs, Cian McConn and Vivienne Griffin. The diverse festival programme includes a discussion Contemporary Witchcraft: Quests and Losses of Femininity with participants Klāvs Sedlenieks, Anna Žabicka, Aija Bley and others on 15 September, and a talk about spirituality quests in art and culture hosted by Sven Kuzmin on 22 September at C.C. von Stritzky’s villa. 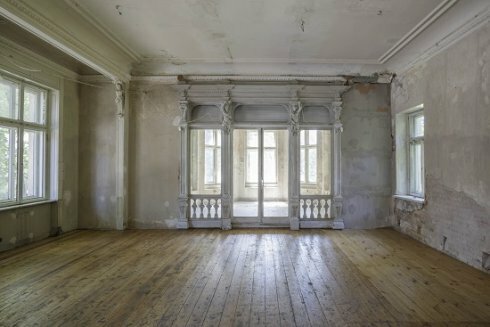 On 16 and 17 September, all day long the villa will be home to Linards Kulless, where he will work with a group of international artists on performance Mending and Bending, To Riga with Love, whereas in a different building within the territory of villa Latvian authors Kate Krolle and Agnese Krivade will present performance The Edge. On the third week of the festival, the symposium Everything is in Everything will take place, where artist Lea Porsager from Denmark, art historian Elita Ansone, curator Pádraic E. Moore and others will participate. On 23 September Italian artist Chiara Fumai will host a creative workshop Technique of Sigilisation, whereas on the last day of the festival – 25 September – audiences will have an opportunity to meet the festival curators Solvita Krese and Inga Lāce. Families with children will be offered a special educational programme as part of the exhibition. It will also be accompanied by a shipbuilding workshop hosted by Artūrs Virtmanis and yoga games on Sundays. A full festival programme of Survival Kit 8 is available here. For certain events, places must be booked in advance due to the occupancy restrictions. The contemporary art exhibition Acupuncture of Society at C.C. 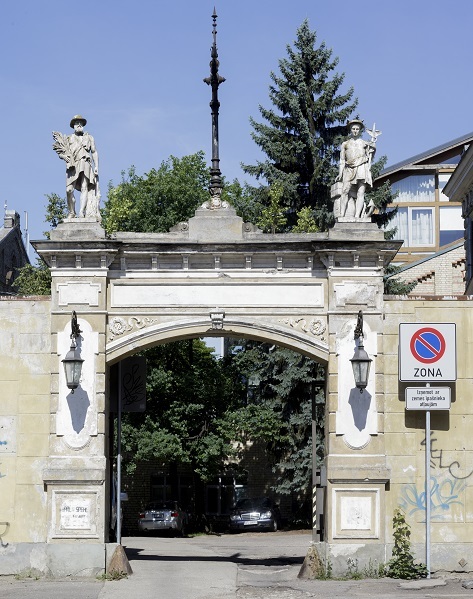 von Stritzky’s villa will be open to visitors 2pm-8pm from Wednesday to Thursday and 11am-7pm on Saturday and Sunday. Ticket information: one day ticket costs 2 EUR, a full festival ticket, which is valid for the entire festival and for all the events, costs 5 EUR. Concessions: one day ticket for schoolchildren, students and pensioners costs 1 EUR, a full festival ticket - 3 EUR. 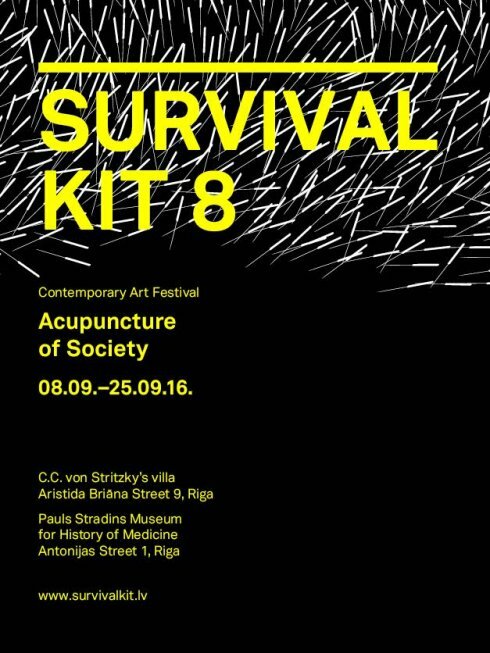 For the eighth year in a row, the international contemporary art festival Survival Kit will take place in Riga. This year, from September 8 to 25, audiences will have an opportunity to visit a voluminous art exhibition and participate in a broad programme of events, which will entail film screenings, discussions, performances and other events. The festival this year will address acupuncture as a metaphor for determining the painful points of contemporary society and will gather approximately thirty Latvian and foreign artists. 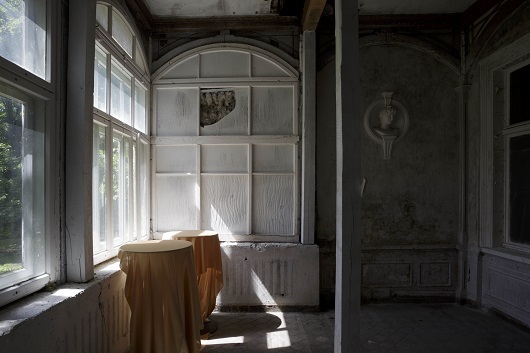 The key venue of this year’s festival is C. C. von Stritzky's villa at Aristida Briāna Street 9 in Riga, which for a long period of time was abandoned but is currently experiencing its revival as a new cultural hotspot in the city. The festival is organised by the Latvian Centre for Contemporary Art and is curated by Solvita Krese and Inga Lāce. “The recent societal interest in alternative medicine and esotericism is viewed critically, evaluating how initially spiritual practices like yoga are increasingly being commercialised. At the same time, the festival will address esoteric ideas as a phenomenon of counterculture, highlighting their holistic potential,” notes curator Inga Lāce. “It is not surprising that many artists include references to spiritualism and esotericism in their oeuvre, both seeking creative impulses and ironically referring to contemporary society’s obsession with the ‘new spirituality’. 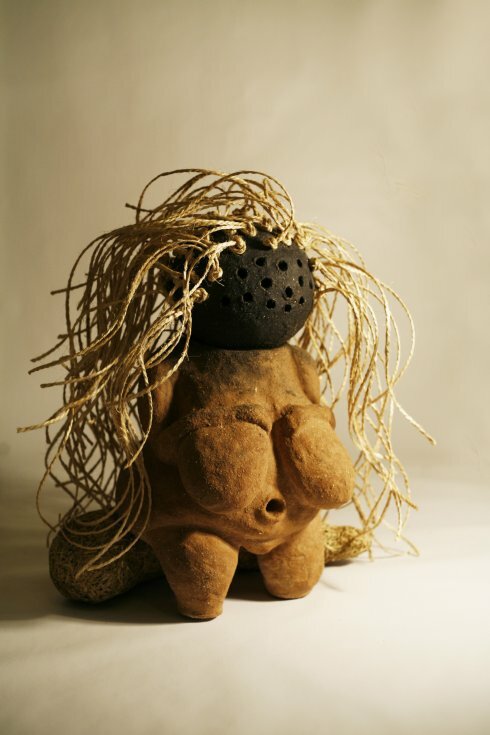 The exhibition will offer an insight into the knowledge of shamans and witches. Also, visitors will have the opportunity to undergo hypnosis, to get acquainted with the effects of psychotropic plants, to meditate under magic symbols and to unveil the magic tricks of the modern-day financial market,” adds curator Solvita Krese. Participants of the festival: Miķelis Fišers, Kaspars Groševs, Atis Jākobsons, Ieva Kraule, Agnese Krivade un Kate Krolle, Linards Kulless, Svens Kuzmins, Katrīna Neiburga, Žanis Valdheims, Artūrs Virtmanis, Reinis Virtmanis, Elita Ansone, Valentina Desideri (NL), Gabríela Friðriksdóttir (IS), Chiara Fumai (IT), Goldin+Senneby (SE), Vivienne Griffin (IRL/UK), Styrmir Örn Guðmundsson (IS), Paul Philipp Heinze (DE), J&K (DE/DK), Marte Johnslien (NO), Myriam Lefkowitz (FR), Géraldine Longueville (FR), Marcos Lutyens (USA), Cian McConn (IRL), Pádraic E. Moore (IE), Shana Moulton (USA), Christoph Mühlau (DE), Lea Porsager (DK), Katarzyna Przezwańska (PL), Floris Schönfeld (USA/NL), Melissa Steckbauer (USA), Magda Tothova (SK), Dovile Tumpyte (LT), Suse Wächter (DE), Simon van der Weele (NL) & Hannah Klaubert (DE).